Cromartie Timber are Hardwood Timber Merchants in the North of Scotland supplying Sawn Timber, Beams & Structural Timber, Larch Cladding for Construction & Boat Building, Picnic Benches and Wooden Flooring. 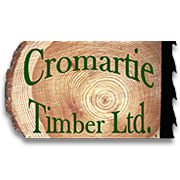 Cromartie Timber is a small hardwood sawmill, located near Strathpeffer, Scotland, who supply timber throughout the country, particularly in the north. All of the logs that they cut are Scottish, mostly coming from the local area. Their timber can be seen at various locations throughout the Highlands. Sawn Timber, Beams & Structural Timber Cromartie cut beams for oak frame buildings as well as other structural hardwoods. They are also specialist suppliers of quality softwoods—European Larch and Douglas Fir. They supply larch cladding for all types of construction—for self build or commercial builds—and for use in the boat building trade. Their cladding can be profiled if required. Cromartie also supply a selection of kiln dried native hardwoods to furniture makers, joiners and woodworkers. Their hardwood stocks vary, and you may have to order in advance, particularly if you are looking for large volumes. Give them a call, theyre helpful people. Picnic Tables and Benches Cromartie has also started making sturdy picnic benches, using local oak and larch. The picnic tables are made with oak tops and larch legs. These strong picnic tables are ideal for parks, gardens and any picnic areas. Recent customers include Highland Regional Council. Wooden Flooring Cromartie also supply larch flooring. Please enquire for availability of other woodenflooring. Cromartie Timber also supply timber to their sister company Ardival Harps—renowned makers of harps and modern clarsachs.